Simon James, violinist, is Second Assistant Concertmaster of the Seattle Symphony and is a founding member of the Australian World Orchestra. He has also been a member of the Melbourne Symphony Orchestra and Lincoln Center’s Mostly Mozart Orchestra. 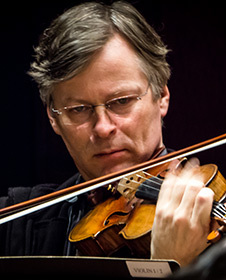 He frequently serves as concertmaster with the Seattle Symphony, Seattle Opera, and the Seattle Chamber Orchestra and has performed as guest concertmaster with the Vancouver and West Australian Symphonies, and the Bolshoi Theatre Orchestra. James has led the Seattle Orchestra in Seattle Opera productions of The Ring, Der Rosenkavalier, La Bohème and The Flying Dutchman, among others. James is also an active teacher with students who have won international competitions and been admitted to the nation’s most prestigious music schools, such as The Juilliard School, the Curtis and Colburn schools of music, and New England Conservatory. James graduated from the Manhattan School of Music, receiving instruction from teachers including Erick Friedman and Syzmon Goldberg.